and raining some more today. stop for another 8 months like it did in Las Vegas. It's funny what you become accustomed to over the years. listening to the rain against the window. I started crocheting star garland with my favorite, linen yarn. Star garland...for the holidays, or everyday. You can make them any size, or any color. I'm using a 3.50mm steel crochet hook with linen yarn. Step 1: Ch 5, join with a slip st to form a ring. Step 2: Ch 3. 14 dc into the ring. Slip st to 3rd ch of ch3 to form a circle. 1 tr in next ch.Skip 2 dc, slip st in next dc. slip st at base of first point. Ch 20, and repeat from Step 1 for garland. I'm looking forward to a lovely, and quiet Thanksgiving with Russell. and happiness within your heart. Your star garland will look especially pretty at Christmas time!! The rain here in Houston is different than what I'm used to too. It won't rain for awhile and then we'll get something like a tropical rain storm where it rains buckets and buckets, then the sun comes out again. It made it difficult to know how to dress this summer. I really hate getting my feet wet, but I like wearing flip flops on a hot day. you had me at "linen yarn"! love your star garland very much. embrace the rain! The linen yarn looks great!! Love the stars! I saw on the news this morning that you are getting LOTS of rain. Stay safe. And I ADORE your stars! Your star garland is lovely Becca. Enjoy your Thanksgiving which sounds very relaxed. Rainy days are wonderful creative days. Thank you for the tutorial. This garland is really beautiful. I will have to get some of this linen thread. Happy Thanksgiving to you and Russell. just darling... was it your photo of this that I saw on Pinterest? have a lovely Thanksgiving! Such sweet little stars Becca! Your Thanksgiving sounds like my idea of a good time! Well....except maybe the watching football part. LOL! I hope you and Russell have a beautiful Thanksgiving in your new home! Yes the rains are definitely here, great time for indoor activity. Really love your star garland, especially in that linen thread. It looks like you're putting your rainy days to good use. Mobile, Alabama, is usually one of the rainiest cities, along with Seattle, but for the last two years, we've just been average. I don't think it has rained reall well here since October. I think we need to do a rain dance. So pretty, Becca! Pinning! Thanks for sharing the tutorial! Hope you have a wonderful Thanksgiving! Hi Becca! It is nice to meet you! Thanks for stopping by my blog and following! I'm going to go grab my hook and yarn and sit here, listening to your rain (even though I have my very own, right outside!) and make a garland of my own - love it! I know that you love the rain, lol, but we have had so much here that it's damp, and we thought we got away from that. Love your star garland, and if I could crochet worth anything, I would give it a try. I made one out of clay stars, I will share it one day. Nice garland, Becca. What a great idea! Hope you had a nice day yesterday. We had fun celebrating another first with Max. It must be so strange to go from the desert to Seattle! I am enjoying you, enjoying the changes. Love this star garland. so perfect for the season. Wishing you a wonderful beginning to your week. This looks wonderful, Becca, such a great idea! It's so great to read how much you enjoy Seattle!! The star garland is absolutely adorable!! Thanks for sharing the pattern. My first visit here - found my way from Lisa's :). Your blog is lovely. That star garland is CUTE!!! oh excellent. i'll make one for my little girl. 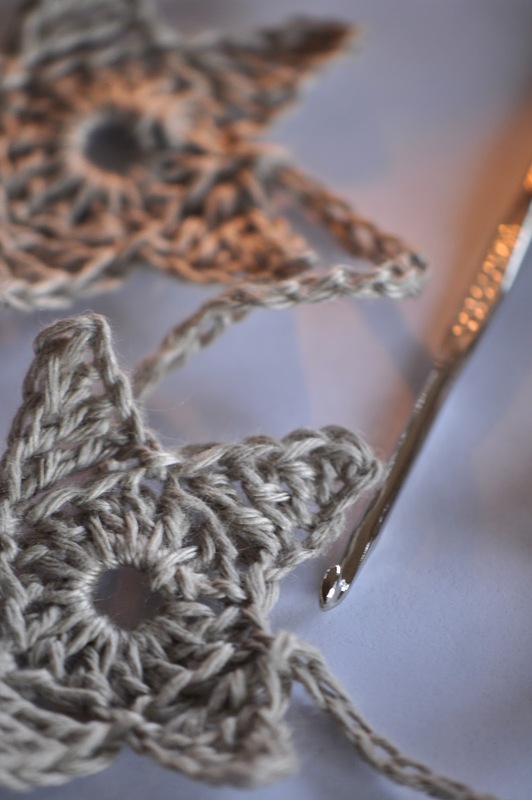 never seen crocheted stars so hadn't considered them crochetable (new word). I love your star garland. Which linen yarn is your favorite? I love this idea. Thank you for sharing. I tweaked your pattern a little so the stars hang pretty from the garland. As I finish the first point, I catch the third ch from the ch 20 in the slip stitch as well. Then I continue to build the remaining four points of the star. 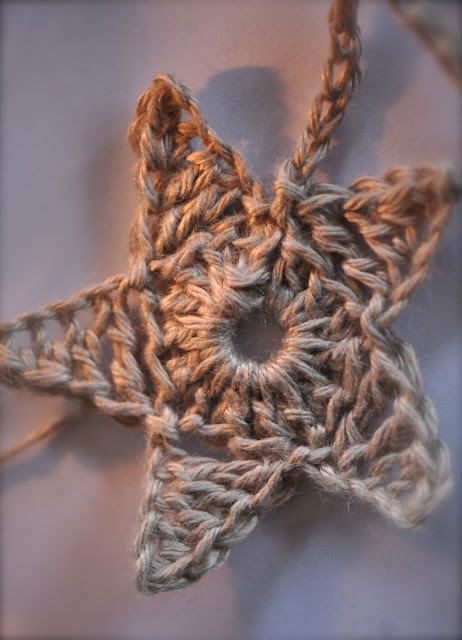 I am changing my room over to a rustic theme, so I am making these stars out of twine. They curl up, so I crocheted along the edges with extra fine crochet thread. Looks adorable!